The European Union has kicked off a five-year project that aims to create transportable, zero-emission replacements for the diesel generators widely used for backup and temporary power. 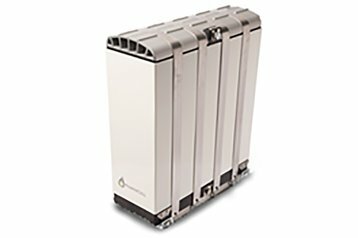 The Everywh2ere project has brought together twelve companies from across Europe, and given them five years and €7 million ($8.6m) to build eight “plug-and-play” gensets powered by proton exchange membrane (PEM) hydrogen fuel cells, to be used for portable, temporary power in urban environments. “The project will integrate already demonstrated robust PEMFC stacks and low weight intrinsecallty safe pressurized hydrogen technologies into easy to install, easy to transport transportable gensets,” says the project summary on the EU’s Fuel Cells and Hydrogen Joint Undertaking (FCH JU) page. Prototypes will be tested at construction sites, music festivals and urban public events across Europe. The first long-term applications are expected to be emergency and construction sites, mining and industrial sites and ships in harbor, but the potential for lowering emissions in data centers is obvious. The twelve firms involved are: PowerCell, RINA Consulting SPA, Italy; VTT Technical Research Centre of Finland Ltd, Finland; Genport SRL, Italy; Swiss Hydrogen SA, Switzerland; Mahytec SARL, France; Fundación para el Desarrollo de las Nuevas Tecnologías del Hidrógeno en Aragón, Spain; Green Music Initiative / Delta1 gUg, Germany; Environment Park SPA, Italy; Acciona Construccion SA, Spain; ICLEI European Secretariat GMBH, Germany and Linde Gas Italia S.r.l, Italy. The project funding comes from the Fuel Cells and Hydrogen 2 Joint Undertaking under grant agreement 779606. The Joint Undertaking itself receives support from the European Union’s Horizon 2020 research and innovation programme, Hydrogen Europe and Hydrogen Europe research. For more information about innovations in data center energy efficiency, visit DCD’s Energy Smart event in Stockholm on 13 March 2018.